Mountain Safety Research (MSR) is a great company that makes absolutely fantastic gear and their range of ultralight tents and tarps is unrivalled. On the issue of expedition tents, however, they still have some work to do and the MSR Asgard shows this. It is a great tent with fantastic potential and is well made and light, but it doesn’t quite run with the really big boys in the world of high mountain and expedition tents. The tent is a classic double wall expedition tent. It has pretty steep walls (thanks to its bow-frame design) that gives it plenty of head-room and also steeply sloping side walls that maximise internal volume. This also helps to reduce condensation. It is very streamlined, so if pitched correctly facing into the wind it should be able to cope with quite serious storms by spilling wind over the top. It also has a strong construction and strong poles that should also allow it to shed high wind loads and snow. The fabric itself is 40D x 238T ripstop nylon 6 1500mm polyurethane & silicone coated, which is proven to be strong, long lasting and waterproof. 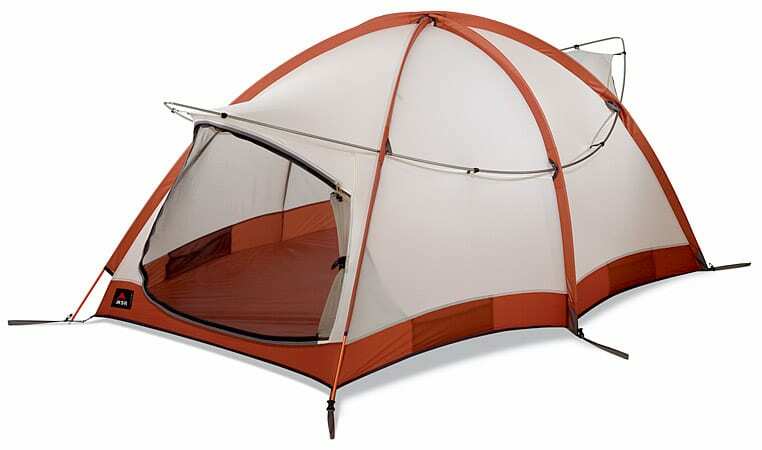 As for weight, it comes in pretty well for a double- tent of this size and specification. Its minimum weight is 3.4kg (7 lbs, 6 oz). 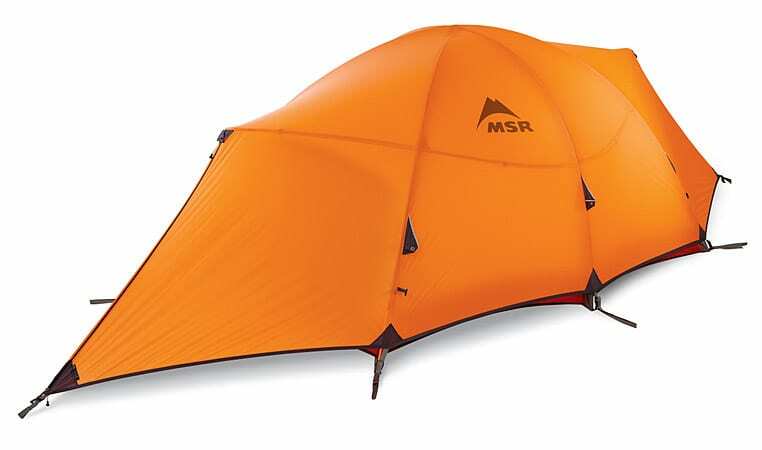 Like most MSR Tents, it is also very quick and easy to set up. What’s not to like about the Asgard Tent? If you stopped reading now, you might be perfectly happy and could end up with a tent that would provide great service. But if you are looking for a real expedition tent then this falls a little short in a few areas. The most comprehensive review I’ve come across is by the American Alpine Institute which looked at the tent. I highly recommend you read their full report. The primary concern with the fly is the layout and function of the vestibule space. The vestibules are simply not large enough for extended expedition usage. The zippers down the roof apex are also challenging to operate and impossible to reach while inside the tent body, making venting and peeking outside a chore. The testers noted that this is a roomy tent and quite liked the fact that there is space for even the tallest climbers to sit upright. But they didn’t think that it would be a workable tent for 3 people (other than in an emergency) because the two sleepers on the outsides would be pressed up against the tent fly and would get wet sleeping bags from the condensation gathered on the inside. In this they suggest it is a roomy two-man tent rather than a lightweight option for three. Overall, this is a good tent, but not quite up to expedition standards. Its lightweight design is likely to withstand a few seasons or expeditions of abuse, but the setup complexity, vestibule spaciousness, and other assorted shortfalls warrant minor redesign. The MSR Asgard has not been awarded a Guides Choice Award at this time. In violent, late-winter winds at the base of Colorado’s 14,265-foot Quandary Peak–gusts that snapped two poles on a competing tent pitched 10 feet away–the Asgard remained rock-solid. It has five 10.2mm DAC poles and “bow-frame” geometry that proved to be the toughest in the test. “I set my 45-pound pack on top of the tent, and the poles didn’t even bend,” said one tester. If you own this tent and have any views please contact me, as I’d love to get a first-person MSR Asgard review posted up here as this is not a tent that I’ve used myself. I can agree with other reviews about the cons of the Asgard, but my primary complaint is that I bought it for use in high winds in the Faroes. To my surprise the straps at the end pointing into the wind came loose during the night to the extent that they came off the pegs! I’m very curious I’ve not found this mentioned in any of the reviews- maybe it’s a fault specific to my tent? Before I contact Cascade Designs, I’d like to see specifically what MSR say about this tent, and therefore why I bought it- but due to it’s discontinuance this aint possible! I do still have the tent labels, but they’re a few hundred miles away. protection or simply enjoying the view – even in nasty weather. They certainly imply that it can be used in strong winds so I would write to them. Meanwhile if you have any photos etc please let me know and I’ll post them up here for others.